You still have a slight chance at getting one of these ARTHAS galleys at our sister site WorldofWar.net where I am giving away ten more. The WorldofWar.net giveaway ends tomorrow Monday, March 9th. So get going and participate there too. Do you remember our recent Ulduar Exploring PTR 3.1 Coverage video? You know how tall is the Prison of Yogg-Saron from the upper level where the broken crystal dome is … down to where the icy pool is. It is very high. Well, we teleported to the Antechamber of Ulduar, I was walking alongside some players to open the door that leads to that hub chamber … and my, oh my! A sight froze us as something that wasn’t there before covered the whole screen … watching at us with a threatening look. Behold Kologarn … a massive bonafide … Titan? This is by far the tallest boss in World of Warcraft, except maybe for Kil’jaeden. Probably taller than that Scourge robot roaming Zul’Drak. The most notorious thing about this boss is that his hands are tagged as separate objects: Left Arm and Right Arm. Stone Grip: You will see onscreen a message: Kologarn casts Stone Grip. You can also listen to a voice emote: “I will squeeze the life from you!”. After this emote, he grabs a random player in his left arm. This does over 3700 physical damage to the affected target every second. Keep a healer keeping this target alive at all times. All DPS must be diverted to his left hand to make him release the player before he kills his victim. Overhead Smash: He does around 8000 melee damage and decreases armor by 25% for 30 sec. It would be good to have some +Armor potions/elixirs to compensate. Shockwave: When he yells: “Oblivion!! !” he casts an instant AOE causing nature damage to everyone in the party. On plate it hit me for 9547 damage. If a hunter keeps nature buff up on everyone, this helps a lot. With nature buff, I got hit for 6867 damage (1768 resisted). Keep everyone at full health at all times. This can kill a few players that are at half-health. Petrifying Breath: Inflicts between 18000 to 21000 nature damage every 1 sec and increases damage taken by 20% for 8 sec. 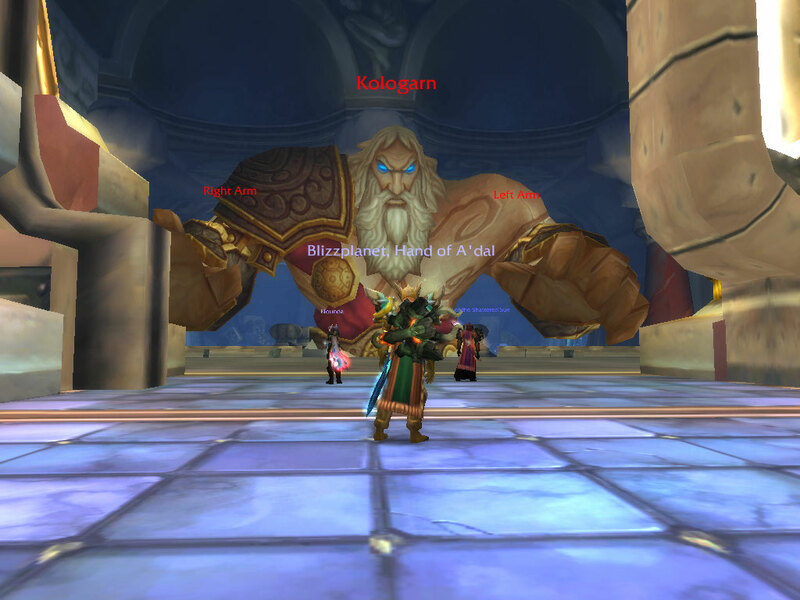 Don’t stand in front of Kologarn to avoid his breath. Focused Eye-beam: You will hear a voice emote: KOL’TARISH. 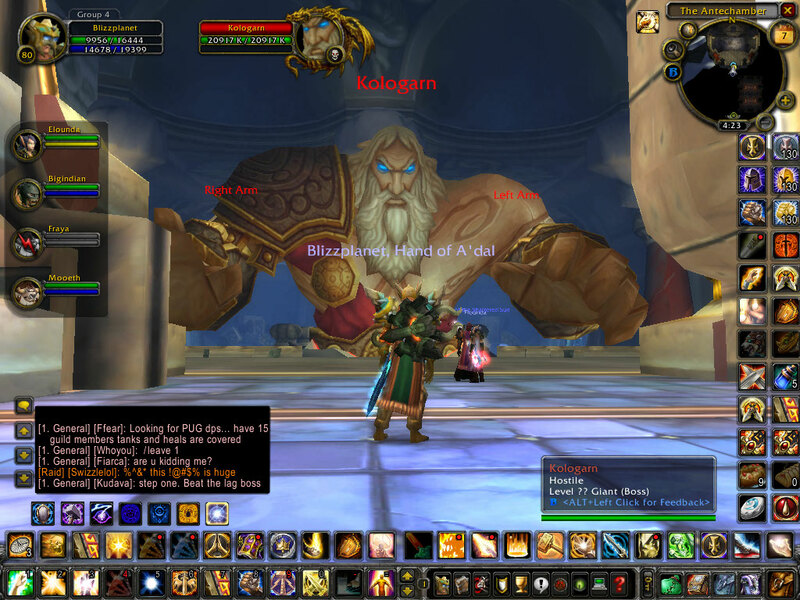 Shortly after, Kologarn shoots an eye-beam at a random target [usually a healer]. This eye-beam has two streams at the beginning. That’s your queue to start running away. Once the two streams unite into a single beam, it will chase the player across the ground for approximately 5 seconds, then he stops casting and it vanishes. As you may watch in the video below, I was panicking each time it was casted on me. From observation, it does 2384 nature damage (615 resisted) per tick. If staying still doesn’t kill you, a healer should be assigned to keep the tank healer alive at all costs. In theory, the tank healer can stand still spamming heals on the tank and off-tank when the eye-beam is set on the tank-healer. Here concentration aura could do well. The only issue is that right after the eye-beam he casts Oblivion (6,000-9547 damage) which could kill the tank-healer. Daelo posted the new PTR 3.1 (build ) Ulduar Raid Testing Schedule. Start making arrangements with your guild, or schedule your testing time in advance. This will allow you to get a feeling of the event, but please submit your feedback and bug findings to the developers. Flame Leviathan (Normal, i.e. 10 Player Mode ONLY) – Tuesday Night, March 3 at 4PM PST (or after the PTR servers come back up) through tomorrow. We want a lot of testing on this, but take note that the Heroic version of this fight should NOT be tested at this time. Players should only form 10 player raids to test this. The Heroic/25 Player version is not properly tuned. Ignis the Furnace Master – Wednesday night, March 4, starting at 7pm EST/4pm PST. Flame Leviathan (Normal, i.e. 10 Player Mode ONLY) – Wednesday Morning, March 4 at 01:00 CET (or after the PTR servers come back up) through tomorrow. We want a lot of testing on this, but take note that the Heroic version of this fight should NOT be tested at this time. Players should only form 10 player raids to test this. The Heroic/25 Player version is not properly tuned. Thorim – Thursday night, March 5, starting at 7pm CET. Freya – Friday Night, March 6, starting at 7pm CET. We should have General Vezax (EU), XT-002 Deconstructor (US), and Razorscale(EU) available for testing soon after this. This schedule could change at a moment’s notice due to server, bug, or patch status. I’ll try to keep everyone informed as much as possible. Ulduar and the bosses to be tested will remain also open a variable length of time. How long they stay open depends upon a host of factors including designer availability, bug status, etc. We also hope to have the zone open on off days for each respective realm for a longer period of time. We have a couple special versions of Patchwerk setup. One of them is called Patchwerk (DPS Test) and is essentially a massive training dummy for your raids. The other is Patchwerk (Tank Test), and he does not have a Hateful Strike, but his melee damage increases over time. We’re very interested in seeing combat logs and parses for all raid testing on the PTR. Q) Will there be testing available on Oceanic, Korean, or other time zones? A) There will be some testing available. Flame Leviathan will be up for an extended time, for instance. Q) Where’s all the trash? A) We don’t have everything turned on for these tests, and this sometimes includes trash creatures before each boss encounter. A) We don’t have this attached to bosses yet, but we’ll have loot hooked up soon. A) These aren’t implemented yet. Lifebloom seems to have been nerfed yet again in the new PTR 3.1 patch update released today. However, the developers don’t share the sentiment. Lifebloomd heals as much as it currently does in life realms. Just it costs more mana. The logic behind this is that with the changes in mana regeneration, they had to balance the amount of lifeblooms a druid can pump out in comparison with the mana capacity of other healers once patch 3.1 is released. If you think about it, if Lifebloom remained as it is, with no penalties, when priests and shamans are suffering from a lower mana regeneration, Druids would be less strained spamming lifeblooms and topping the healing meters. In that sense, I would have to question whether this is necessarily a nerf, when most other classes will experience different issues with their mana regen lowered. A lot of podcasters are going to love this. Blizzard has a new contest to crown the best Arena shoutcaster. Simply download the video provided by Blizzard, and record your own commentaries and submit your entry. What are the prizes? Dell Ultrasharp 2007WFP-HC monitor and a BlizzCon 2008 polar bear mount. According to article 2 of the terns and conditions only participants age 15 and above; and the competition is opened to residents of France, in Belgium, in the United Kingdom or in Luxemburg, or anyone aged 18 or more residing in Germany, Austria, Sweden, Finland, Denmark, Norway, the Netherlands, Spain, Russia, or in Ireland, and who have an open subscription to the World of Warcraft game. AT&T renewed their hosting agreement with Blizzard Entertainment, Inc. for online games over Battle.net and World of Warcraft servers. A press release is available. LOS ANGELES, March 3—Online gamers will continue to enjoy a rich and reliable gaming experience thanks to an agreement struck between AT&T* and Blizzard Entertainment, Inc. Today, AT&T and Blizzard Entertainment, Inc., a premier developer and publisher of entertainment software, agreed to a two-year renewal for hosted services in North America. Blizzard Entertainment(R) is best known for its Warcraft(R), StarCraft(R), and Diablo(R) PC games as well as its massively multiplayer online (MMO) role-playing game World of Warcraft(R), which is available in eight languages and played by more than 11.5 million subscribers worldwide. ** AT&T has been working closely with Blizzard Entertainment for 9 years, providing hosting for World of Warcraft and the Battle.net(R) online-gaming service. Through multiple Internet Data Centers (IDC), AT&T will provide strategic hosting and proactive, 24/7 network monitoring and management for the online infrastructure of Blizzard Entertainment’s games and services. The AT&T Gaming Core Team will provide comprehensive networking support to Blizzard Entertainment. The AT&T Gaming Core Team was formed in 2004 to meet the infrastructure needs of customers’ gaming operations across AT&T’s Internet Protocol (IP) network. The team consists of engineers and hosting specialists who provide round-the-clock support to companies offering MMO games. The team provides global, end-to-end support of customers’ gaming operations across AT&T’s hosting infrastructure, applications and IP network and supports trouble resolution, incident command and control, post incident review and root cause analysis. According to the Entertainment Software Association, which represents computer and video game publishers, U.S. computer and video game software sales grew almost 23 percent in 2008 to $11.7 billion. For more information on AT&T Hosting and Application Services, go to http://www.business.att.com/hosting. The 2009 British Academy Video Games Awards has nominated World of Warcraft: Wrath of the Lich King for 2008 Game of the Year. The fans can cast their vote to decide this category’s winner at the following webpage. Vote entries will be closed on Monday 9 March 2009. UK residents have an extra incentive to cast a vote by marking the checkbox to participate in a prize draw: Read the Terms & Conditions. Voting for your favourite game is quick and easy. Simply click on the game you wish to select then complete the form below. Yesterday, Sunday, Blizzard opened Ulduar with two copies of Naxxramas’ Patchwerk: One was tagged as DPS Test and the second was tagged as Tank Test. My group was able to kill the DPS test Patchwerk twice with some difficulty. However, we couldn’t kill the Tank Test dummy. We went as far as 1.3 million health.before he killed the tank. Daelo revealed the reason. It hits a 10% harder every 10 seconds. It is recommended to bring consumables and flasks to these tests in order to help fine-tune the event. Make sure to share your feedback about the Patchwerk DPS and Tank Tests at the following official forums thread. Here will be a thread for everyone to post their test results from attempts against the two versions of Patchwerk on test. One version is essentially just a normal patchwerk with double the HP for use as a DPS test. This is Patchwerk (DPS Test). The other version we currently have is Patchwerk (Tank Test). This is Patchwerk without the Hateful Strike, double the HP, but most importantly every 10 seconds his melee damage increases by 10%. Not only are we looking to see just how long tanks can be kept up given maximum effort from the entire raid, but also how long can tanks be kept up with more limited numbers of healers. Also, if there are suggestions for modifications or new versions of test Patchwerks, we’d love to here it. On a side note, we’re working to get a test glyph vendor created. It won’t be ready for the next build to hit PTR, but we’ll have it later.